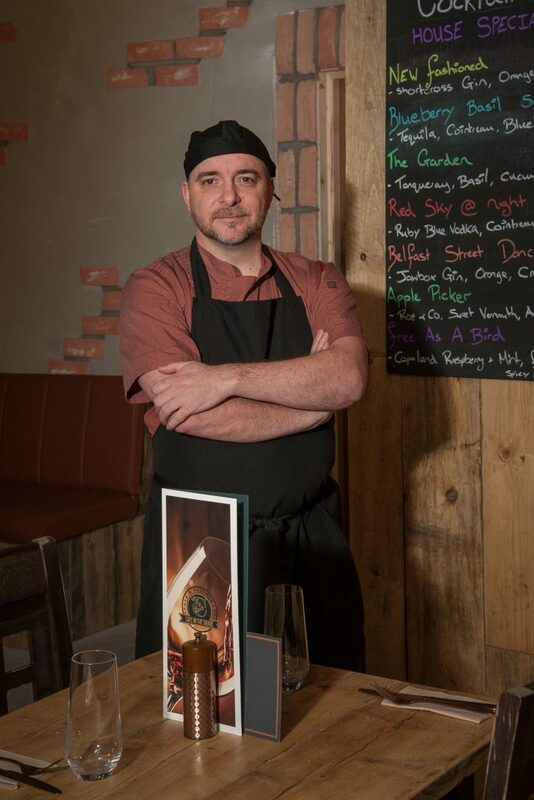 At 42, David Knox couldn’t be happier with his new position as head chef at Shane Corr’s busy little Belfast eatery, Café on the Square. It’s the latest stopping point on a career that’s seen him ply his trade in a diverse array of venues around the British Isles. David says that he’s always felt that he was best suited to a career as a chef and from the age of 19, when recruitment agencies began dispatching him to a range of jobs, he favoured those that put him to work in the kitchen. His first restaurant position was in the former Quincey’s in Lisburn where he went at the age of 20 to work as a commis chef. At the same time, he was studying NVQ level two in cookery at college in Lisburn. From there, he moved to All That Jazz on the Lisburn Road. David’s first head chef’s position was at a pub and night club off the Dublin Road in Belfast called Culpa. He was 23 at the time and he spent about a year at the venue before moving on. When he was 26, David decided that it was time for a radical change and so he relocated to the Channel Islands. It was the beginning of the most instructional part of his career. He landed a job as head chef at Le Hocq Inn, the most southerly pub in the British Isles, where he served up traditional gastro-pub fare with a modern twist. David stayed at Le Hoqc for two-and-a-half years but he worked on Jersey for around nine years all told. David was 35 when he returned and almost immediately, he took a break from kitchen work for a couple of years. During that time, he began to raise a family and got involved in a retail project that lasted for about three years. Eventually though, he felt the pull back to hospitality and in 2016, he opened his own premises – The Big Sammich on the Ormeau Road. The shop was open for about a year and during that time, it garnered a five-star rating on Trip Advisor. Behind the scenes, however, David was working seven-days-a-week to keep the business going and he felt that ultimately, this was unsustainable. ‘I had the right product, but it was in the wrong place,” he says simply. He took on the head chef’s position at Café on the Square in May and he says he’s ‘over the moon’ with the way things have been working out. During the day, the venue enjoys a thriving lunchtime sandwich trade and its all-day breakfast is very popular but at 5pm, the mood changes as it switches over to a much more sophisticated evening menu. When David took the job, it was on the understanding that he would get the venue up and running, then move on to help open the next outlet in what owner, Michael Campbell hopes will become a successful chain of café-bistros.